Kishtwar National Park in the Kashmir region of Northern India recently reopened in 2012 after a nearly twenty-year hiatus. 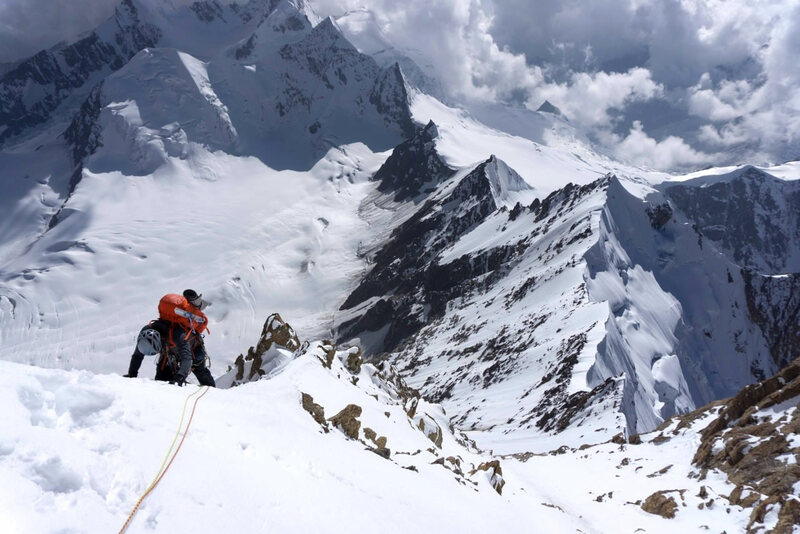 The potential for unclimbed lines and mountains has drawn in a number of expeditions over the last few years, and we were also excited to explore this dramatic part of the Himalaya. Jeff Shapiro and I contacted our friends Damian and Darcy Mast who were in the region in 2012. Their images, as well as the mystery of the area, intrigued us. 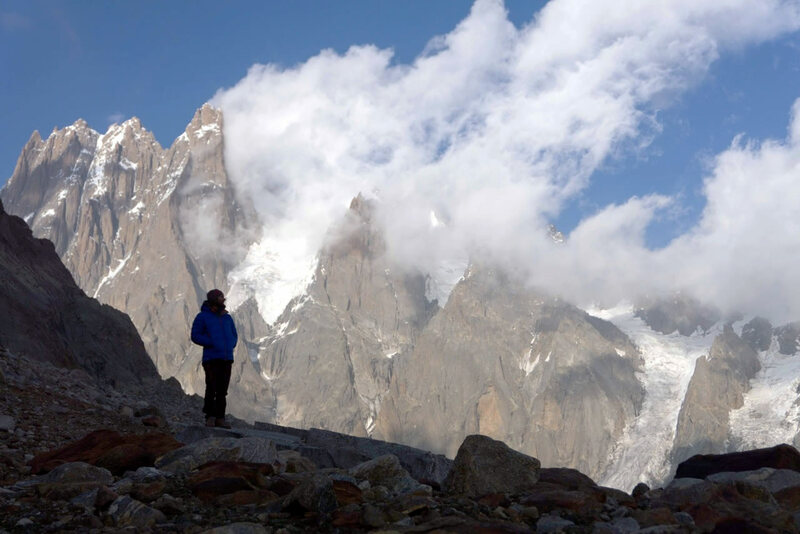 There are so many beautiful peaks and places that have yet to be explored; we had to go there. Through our research, we discovered an area with very little information about it, the Kijai Nala drainage. This drainage leads to a cirque between Brammah II (6425m) and Arjuna (6230m). After looking deeper we discovered a few Polish reports on the area, which mainly described the horror of the approach. The Google Earth images revealed two amazing looking peaks, both with large mixed ice and rock faces. However the quality of the images were less than desired, leaving room for our imaginations to run wild. The exploratory nature of the area captivated us. We had to go. Eventually our cloudless skies gave way to rain, and we were tent-bound for a few days. Weather reports we received from friends told of favorable conditions on the way. After three patient days in camp, we began our push for Brammah II. With our packs loaded down and the terrain difficult, it was slow going. After two days on the move, we reached the base of the South Face and were able to finally lay eyes on it for the first time. There were two obvious lines, but the warm temperatures negated our initially chosen path. Rockfall and wet slides obliterated the line, so we shifted our attention left to a less objectively hazardous route. My alarm blared at two in the morning, and by three, Jeff and I were on the go. We needed to get through the initial lower mixed section before the sun came out, and the mountain started coming apart. Conditions were favorable with the nighttime freeze and we made quick work of the lower face while a dramatic lightning storm illuminated the sky. By the time the sun reached us, we had a straightforward route of mixed snow, ice and rock above. As the day progressed, the distant glacier below faded, as did our clothing. Under the bright sunlight we were down to fleeces. Tired from the heat and altitude, we slowly made progress up the wall. After 13 hours on the go, I climbed to the southwest ridge and found a great bivy site. With pounding headaches from the altitude and dehydration, Jeff and I watched the sun set over one of the most magnificent landscapes either of us had ever witnessed. Enormous jagged peaks stretched as far as the eye could see as the sun disappeared behind the horizon, casting a pink hue over the surrounding summits. The next morning we were up early, beginning to climb as the sun was cresting the horizon. With less elevation to gain, I was anticipating a shorter day. But we still had the crux to climb through. The climbing progressed as it did the previous day and early on, we reached the crux; the shallow corner of ice and rock turned out to be far more enjoyable than difficult. Some barehanded rock climbing and dry tooling kept us smiling as we climbed through the rockband. Jeff and I were now near the top of the South Face proper with what appeared to be only a few long pitches to go. With the increased altitude, the snow conditions worsened, and our pace slowed. I looked at my watch and anticipated a summit time of around 5 or 6 p.m. We continued to simulclimb through the snow and ice, inching our way to the summit. Finally I reached Jeff, and he yelled to me that we probably only had thirty more meters to climb. I grabbed the rack and climbed on. Sixty meters later, I was sitting within inches of the corniced summit tethered to the rock at my feet. Jeff reached me by 6:30 p.m., and we enjoyed the spectacular summit view as the sun dipped to the horizon. There wasn't a hint of wind in the air, and the world below us began to glow with the even light. As we rappelled down, the sun faded quickly and left us under a silent, star-filled night. We made approximately five rappels to get off the upper South Face and onto the lower ice slope. Without a suitable flat spot to bivy, we chopped seats in the ice and settled in for the night. Lightning storms over the flats of India kept us mesmerized as we drifted in and out of sleep. 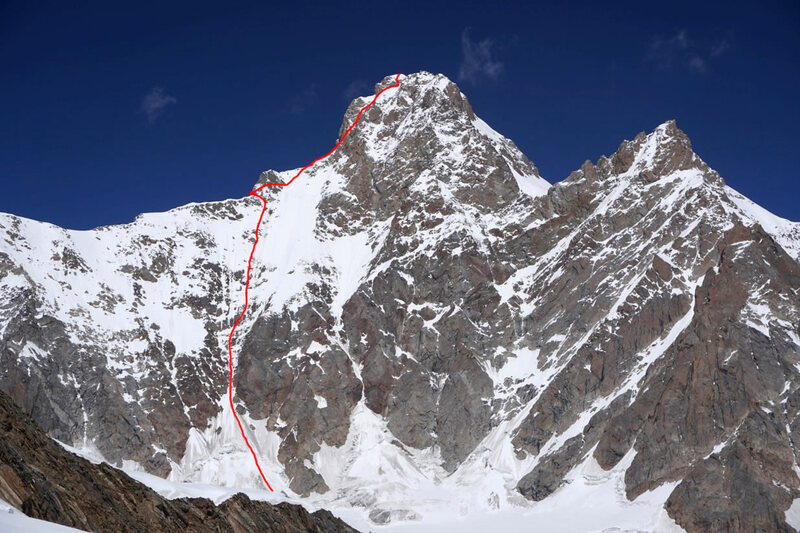 The next morning, we threaded our way down the lower face, reaching the glacial basin before the high temperatures could catch us in the danger zone up high. It was another day and a half before Jeff and I were back to our base camp where we could finally relax and soak in what we had just experienced. The trip was filled with so many hurdles and unknowns. With each one, we took it a step at a time and solved problem after problem without worrying about the overall goal. 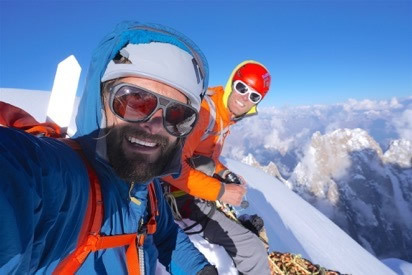 Eventually, all the problems were solved, and Jeff and I found ourselves standing atop Brammah II, with the first ascent of the South Face via a route we called "Pneuma" (VI AI4, M5, 1300m). We want to sincerely thank the Mugs Stump award and Copp-Dash Inspire award committees for helping make this amazing experience a reality.